So, I get a lot of questions about my “go to” gear for my long runs and races, so I wanted to share with you! First up is my beloved Orange Mud Endurance Pack! It’s hands down THE best pack I’ve ever used. And, um, I’ve used a lot. For the race this past weekend, I filled the 1L bladder about 3/4 full of plain water and used that as my auxiliary fluid. My main source was a bottle I carried in one of the front pockets, which I filled with my liquid nutrition (we’ll get to that later in the post) this works super well for me, because it allows me to carry fluid upfront that’s easy to refill and access, but the bladder ensures I don’t run out of water and also gives me the ability to have plain water on me as needed. The front and rear storage pockets allowed me to carry all of my nutrition, my phone, keys, etc. I am an ambassador for OM, so if you have any questions about this pack (or any of the others they carry) give me a shout! The only shoe I trust on my feet from buffed out trails to gnarly rocks and mud, and everything in between, is the Topoathletic Terraventure. This is my all time favorite shoe, period (road or trail) It’s light, responsive, and just feels so natural on my feet. It’s a 3mm drop, and helps me feel nimble even on the craziest of trails. I find it runs true to size. 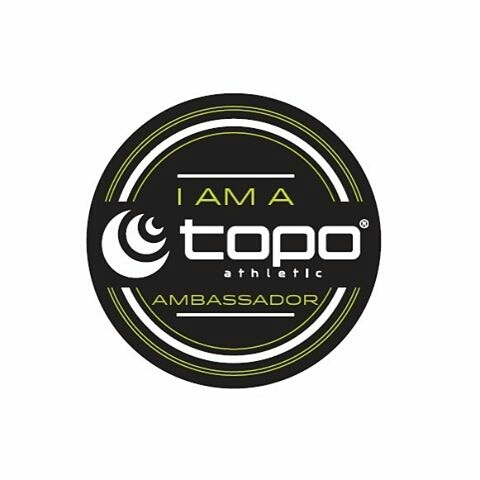 As a Topo ambassador, I can share my code TOPODRTYRUNNER10 with you so you can try a pair for yourself. I’d love to hear what you think! Next up, my go to nutrition, which consists of a blend of Carbopro with Enduropacks squirted in (I carry a bottle of Enduropacks in my pack so I can add it any time.) No crazy excess sugars or overwhelming sickly sweet flavor…just good, honest fuel and electrolytes my body needs. This combo has been a tried and true for me…I have yet to suffer a flash crash, nausea or nutrition issues since I’ve used them. I supplement at aid station with solid food as needed/desired. What’s it like to run 64 miles blister and hot spot free? Pretty dang amazing, let me tell you! When I say I use to suffer from extreme blistering, I’m not exaggerating. We are talking skin practically melting off the bottom of your feet, pinky toe growing an equally large appendage, and “Oh my God I cannot take one more step without crying” blisters. Since using Trail Toes, those days are a thing of the past for me. Can I get an Hallelujah?! I carry a little container with me in my pack, and use it on all of my chaffing “danger zones.” It’s the bestest! There you go! Some of my favorite gear that helped me survive this past weekend at the Never Summer 100k! What’s some of your go-to gear that you count on time and time again?